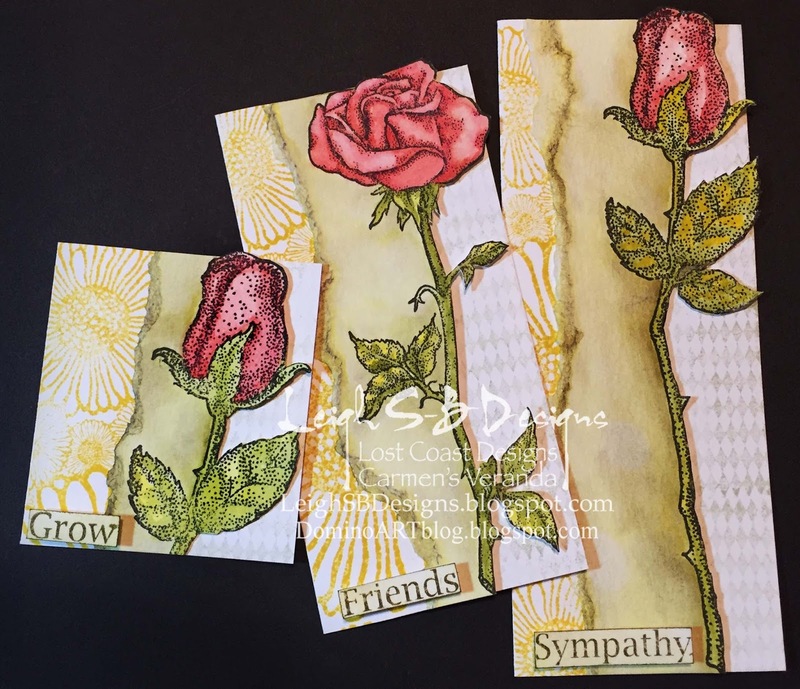 I've been having a blast with my fellow Lost Coast Designs DT members over on our Lost Coast Portal to Creativity Blog for the last 2 weeks showing off our new Lost Coast Designs stamps with a "New Stamps Showcase" event! We hope you have enjoyed and been inspired by our projects every day! If you've missed the fun then pop on over and start on Day 1 and also check out our NEW IMAGES at Lost Coast Designs, they are so freaking awesome you're going to want them all! We are giving away one of our new stamps! Visit and comment on all the New Stamp Showcase posts from January 18 through to today and let us know what you think of our featured projects. Readers who comment every day of the event and then tell us today which new stamp is their favourite will be entered into a random draw to win their fave new stamp!!!! I will announce the winner on Wednesday, Feb 3rd, so you've got time to catch up! 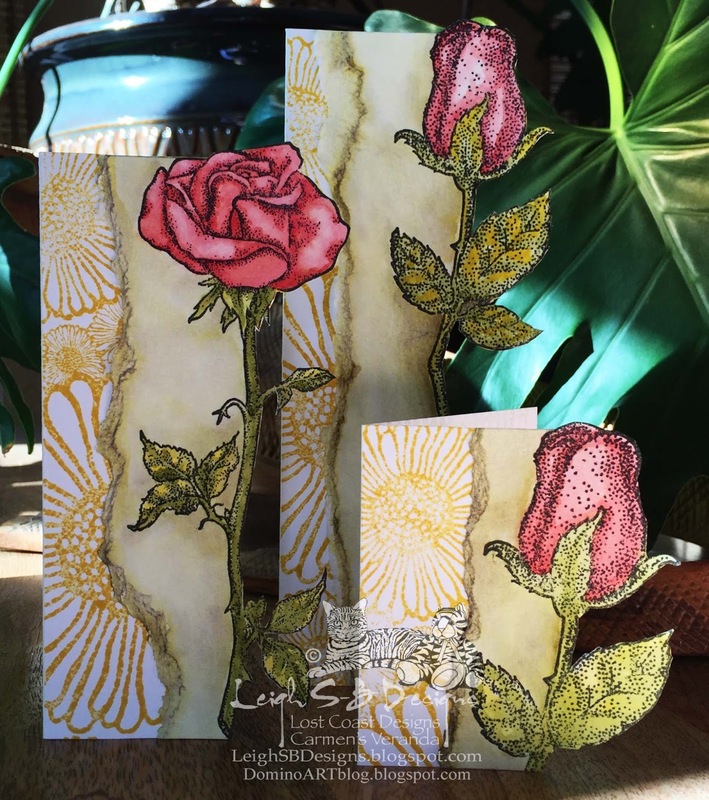 For the finale today I'm sharing a trio of single stemmed floral cards. Open Rose, Tulip, Doodle Flowers and Misc Words as well as the Little Diamonds background. I made 3 fussy cut floral cards, 2 tall and skinny plus 1 small gift card, using the Distress Inks watercolour technique. 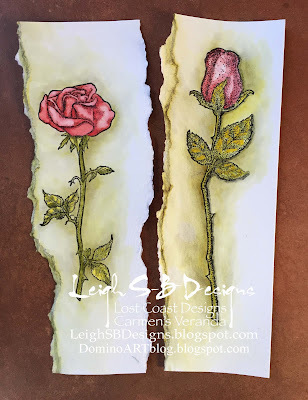 The flowers were stamped on watercolour paper with black Versafine ink and coloured with Fired Brick, Peeled Paint, Forest Moss and Mustard Seed Distress Inks. 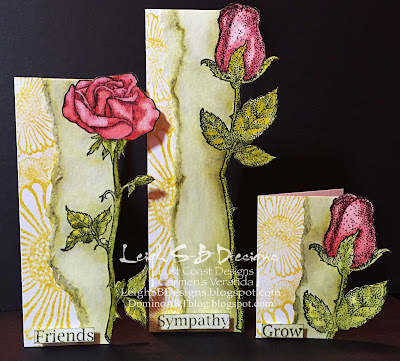 I made the tall and skinny folded card bases from white cardstock and stamped those with the Doodle Flowers in Mustard Seed DI. I then cut away the entire right hand side of all 3 cards. Transform them with single "word" sentiments! The photo below shows them closed with the diamond stamped interiors now visible in the cut outs making the front and insides all part of the overall design. I used Sage VersaMagic ink to stamp the interiors but first I stamped onto scrap paper to remove some ink for a more distressed effect. Thanks for visiting with me today, now don't forget to pop by all the New Stamps Showcase posts starting from the January 18 post and leave us lots of love for the chance to win your fave new stamp! Good to see stamps being used to enhance a card shape, makes for a much more interesting design. And awesome colouring. Really beautiful creations. I love what you've done with the right of the images. Love these, so Spring looking!